Welcome to Moose Hollow MH807! Relax after a day in the outdoors in this newly updated three-bedroom condo! With breathtaking views of the surrounding mountains, access to community pool and hot tub, and easy access to everything from world-class ski resorts to amazing hiking trails, you are sure to enjoy your stay at MH807! Main Level: Kitchen, living room with TV, half bathroom, and balcony. Downstairs: Master suite bedroom with ensuite bathroom and walk-out patio, two standard bedrooms, and laundry room. Bedroom 1: 1 King suite bedroom with ensuite bathroom and walk-out patio. Bedroom 2: 2 Full beds with shared hallway bathroom. 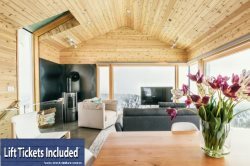 We are truly excited and honored to share our homes with each and every guest and we invite you to stay with us at Powder Mountain Getaways - MH807!